Our unique range of Aluminium Race Spec Bolts. Each bolt is pre drilled on all flats allow for lock wiring, reduce weight further and of course, look trick. We have also etched the Pro Bolt name across the flange of the bolt. The kits includes all the bolts to replace originals on side engine casings including clutch covers, water pump housing, alternator cover and sprocket covers where applicable. 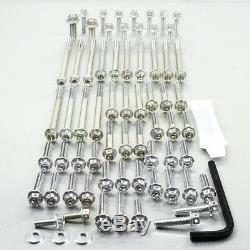 Kits are easy to use, remove one bolt at a time, and replace with an identical length Pro Bolt. This Flanged Hex Head Kit contains primarily M6 diameter threads, our bolts are made from High tensile 7075 grade aluminium and manufactured with rolled threads for extra strength. 3 Bolts of this Kit are Parallel Headed Bolts (non Race Spec). The unique dished and Race Spec Flanged head style of these bolts look stunning when fitted. Also included in the kit are Pro lube and sticker. Please note this kit will include 3 cap head bolts at 90 & 95mm lengths which are located on the clutch cover as unfortunately this size is not available in Race Spec. L'item "Aluminium Engine Kit KTM 1290 Superduke Race Spec" est en vente depuis le lundi 7 novembre 2016. Il est dans la catégorie "Auto, moto pièces, accessoires\Moto\ tuning, styling\Autres". Le vendeur est "probolt_fr" et est localisé à/en lesneven, Finistère. Cet article peut être expédié au pays suivant: France.